Bergen, Norway became the venue for the finale of the prestigious International Edvard Grieg Piano Competition in which the successful young pianist Matyáš Novák placed second. 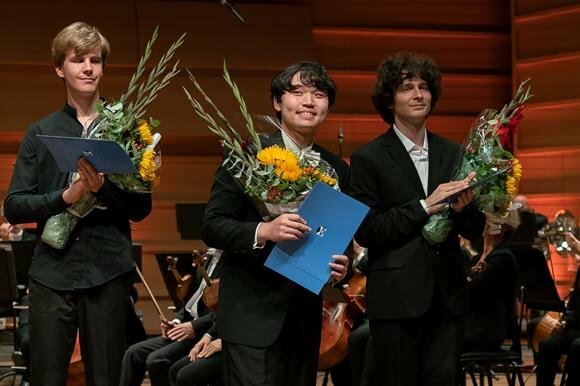 The finale, together with the closing concert, was held on 9th September 2018 in the Grieghallen concert hall in Bergen; accompanied with the Bergen Philharmonic Orchestra, three finalists of the competition performed at this event – the Czech Matyáš Novák, Ryoma Takagi from Japan and the Russian Alexey Trushechkin. In first place finished Ryoma Takagi, who presented the Piano Concerto No. 2 in C minor, Op. 18 by Sergei Rachmaninoff. The beautiful second prize went to Matyáš Novák, who performed Robert Schumann‘s Piano Concerto in A minor, Op. 54. Alexey Trushechkin, who played Grieg’s Piano Concerto in A minor, Op. 16, took third place. The competition was attended by a total of 133 participants from 36 countries. The finalists are awaiting numerous concert commitments in Norway and elsewhere abroad. Many congratulations to Matyáš!